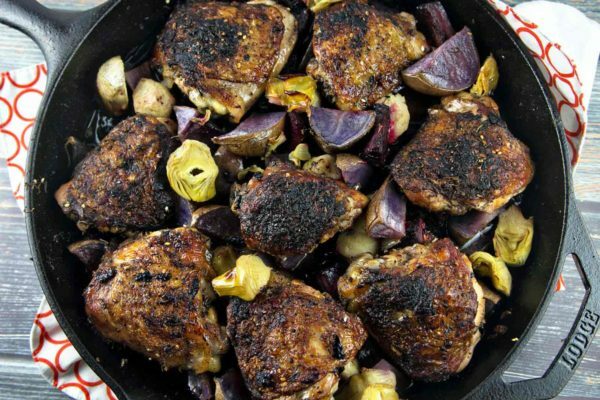 Break out your cast iron pan for this gluten free, paleo, and Whole 30 compliant one skillet crispy Mediterranean chicken thighs, roasted with beets and artichokes. Oh, hey guys. If you’re reading this, congratulations: you survived Thanksgiving yesterday! You weren’t taken out by either food related panic or food related gluttony. I hope everyone had a wonderful holiday, full of family (that you actually like), time honored traditions, and pie. Lots of pie. We spent the evening with my husband’s family, where we had – dare I say – too much pie. Chocolate cream pie. Lemon meringue pie. Coconut cream pie. Pecan pie. Pumpkin pie. I’m on a little bit of a dessert overload, so I thought I’d share something savory today with this one skillet crispy Mediterranean chicken. Don’t worry – we’ll be back to sweet soon. 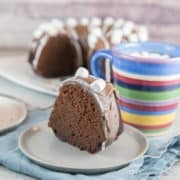 In fact, I have three awesome holiday entertaining desserts planned for next week! But today, we take a break from the sugar. First, though, I wanted to give my thanks to you, my readers. I am beyond thankful that you continue to return, week after week, to see what is coming out of my kitchen. 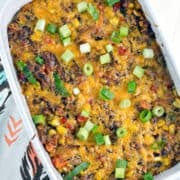 I’m honored and thrilled that my recipes graced so many of your Thanksgiving tables, and that you trust me enough to make a new-to-you recipe for the first time at a major holiday. Bunsen Burner Bakery has been in existence for over 5 years now, but I only started sharing on social media and building up traffic this spring. Over the past seven months, my pageviews have increased 25-fold, meaning there are a whole lot more of you this year than there were last Thanksgiving. This was especially apparent in the number of emails, comments, Facebook messages, and Instagram messages that came pouring in with questions while you were preparing recipes for your Thanksgiving feasts. More than 70 of you reached out during the day, and it truly made my day. I loved interacting with so many readers, and at the end of the day, the “this is the best pie I’ve ever made!” emails left me grinning from ear to ear. I just now noticed some comments that went into my spam filter, so my sincere apologies if you tried to ask me a question and it went unanswered. You guys are awesome, and I am thankful for you. It’s not easy working full time as a scientist, raising a toddler, and running this food blog on the side – but you make it worthwhile. Okay. Enough uncharacteristic sappiness – on to the crispy Mediterranean chicken! 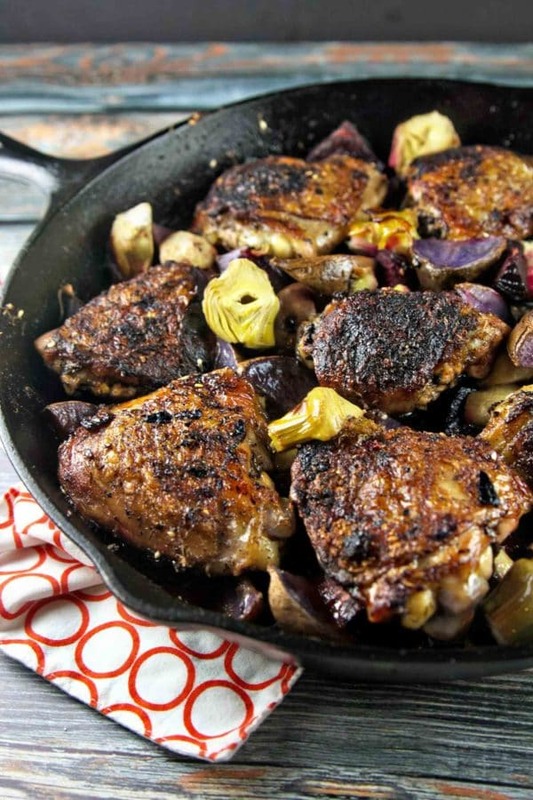 This utilizes my most favoritest technique for cooking chicken thighs: in a cast iron skillet. It gets so, so crispy – without frying in a lot of oil. If you don’t regularly cook meat in your cast iron, let me tell you – you are really missing out. Even if you don’t like chicken skin, I’ll still encourage you to buy bone-in, skin-on chicken. Peel the skin off before you eat it if you must, but it really seals in so much extra flavor. If you really, truly can’t stand it, just reduce the cooking time by 10 minutes for boneless, skinless thighs. We’ll season the chicken thighs with some classic Mediterranean spices: thyme, sumac, oregano, cumin, garlic. Sear them well in the cast iron skillet, then nestle in some beets and artichokes. Add a little chicken stock and a squirt of lemon juice; then pop the whole thing into the oven. I love that this is a one skillet dinner – less to pull out, and only one skillet to wash. Yes, this is a bit more time consuming than many of my weeknight dinners, but the last 30 minutes are in the oven. It’s the perfect amount of time to set the table and pack lunches, or help kids with some homework. 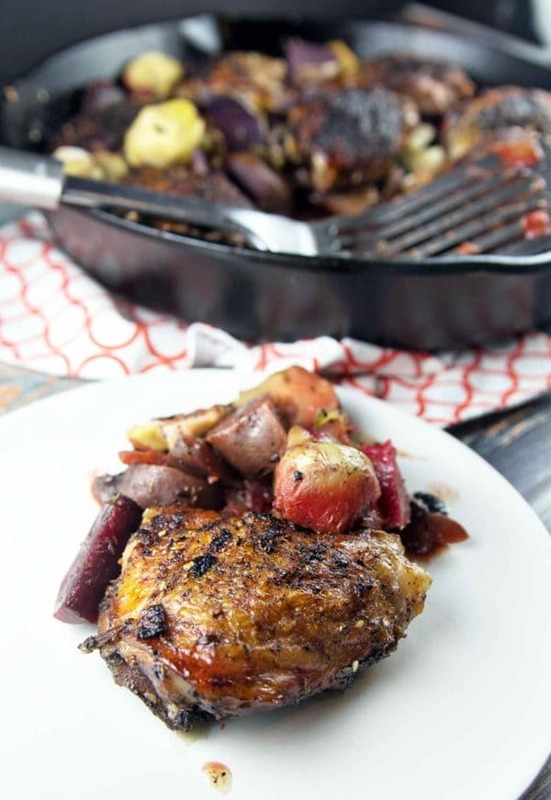 This crispy Mediterranean chicken paired with the beets and artichokes is hearty and filling. Serve with some sautéed greens or roasted broccoli for a low(ish) carb dinner. 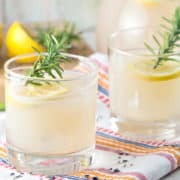 It’s delicious, it’s easy, and it’s a great gluten free, paleo, and Whole 30 compliant way to detox with some real food after all those Thanksgiving pies. 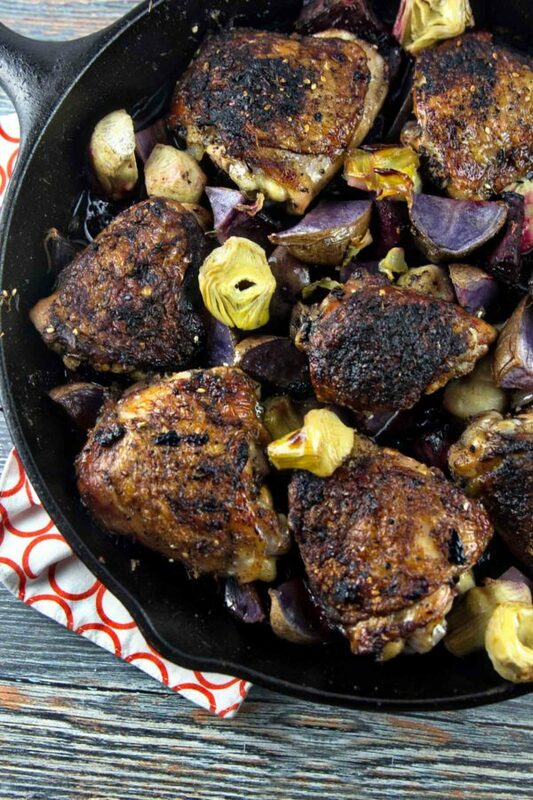 Break out your cast iron pan for this gluten free, paleo, and Whole 30 complaint one skillet crispy Mediterranean chicken thighs, roasted with beets and artichokes. Heat a large cast iron skillet over medium-high heat. Add the olive oil. Once hot, add the garlic to the skillet and stir. While the garlic is browning, rub the chicken thighs with the thyme, sumac, oregano, and cumin. Salt and pepper to taste. Place the thighs, skin side down, in the hot skillet. Check after 5 minutes to see if the skin is thoroughly browned; it will likely take 10 minutes total. Once browned, flip the chicken. Add the chicken stock, beets, artichokes, and lemon juice to the skillet and bring the mixture to a simmer. Transfer the skillet into the oven and bake for 30 minutes, or until thighs reach an internal temperature of 165 °F. I can’t wait to try this. When I saw the picture, I thought “purple potatoes.” What a surprise! I’ve never seen purple beets. I guess I could use red beets if I can’t find them. All in all, this recipe sounds sumptuous and I am pinning it. Thanks for such an easy and delicious skillet meal! Definitely use red beets (or candy cane beets!) – it’s what I’ve used all the other times I’ve made this. The purple beets really tasted exactly the same – but they were so purple! Crazy! I’ve been curious about trying Whole 30 so I’ve been compiling recipes for when I’m ready to give it a go. 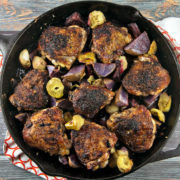 This skillet chicken is perfect! Have you tried Whole 30? What did you think? I haven’t done a Whole 30, but I do cook a lot of Whole 30 compliant recipes. I’ve spent the past 2 years pregnant and then breastfeeding, and I didn’t like the idea of cutting dairy from my diet during either of those periods (I know you can do it safely, but it was more effort than I wanted to ensure I received enough calcium from leafy greens, etc). Now, I have a 1.5 year old who also has good reason to consume dairy, plus I think a lot of the “forbidden” foods from Whole 30 are perfect for a growing toddler, like chickpeas and quinoa. I love the no processed foods part and no added sugar, but the time just hasn’t been right in my life yet to do a full version. Even without it, though, we eat a lot of Whole 30 recipe dinners and I love them! Thanks, Laura! I only “discovered” sumac within the past year or so – before that, I had only had it in spice mixes like za’atar. I am obsessed – I seriously add it to EVERYTHING now. I love the spice you used in this, especially the garlic and thyme. I bet they are delicious with those artichoke hearts! Beautiful colorful pictures too! Wow! Look at that gorgeous crust on the chicken. It looks absolutely scrumptious! What a beautiful post. Isn’t it lovely to know people are making your recipes (especially during the holidays?!). I love it! I friggin’ ADORE roasted artichoke hearts and chicken, so I know for a fact I would fall madly in love with this! I love the addition of artichoke hearts in this recipe! It looks so tasty! Can not wait to try this in my new cast iron skillet.